George William Earl of Bristol, Henry Arthur Earl of Powis, and Richard Lord Edgecumbe, took the Oaths, and made and subscribed the Declaration, and also took and subscribed the Oath of Abjuration, pursuant to the Statutes; their Lordships having first delivered Certificates of their receiving the Sacrament, to the Truth whereof Witnesses were sworn and examined. Act for the Preservation of the Public Highways, to amend, Bill. With a Bill, intituled, "An Act to amend an Act made in the Twenty-sixth Year of the Reign of His present Majesty, intituled, An Act for the Amendment and Preservation of the publick Highways and Turnpike Roads of this Kingdom; and for the more effectual Execution of the Laws relating thereto;" to which they desire the Concurrence of this House. St. Saviour's Southwark, Market, Bill. 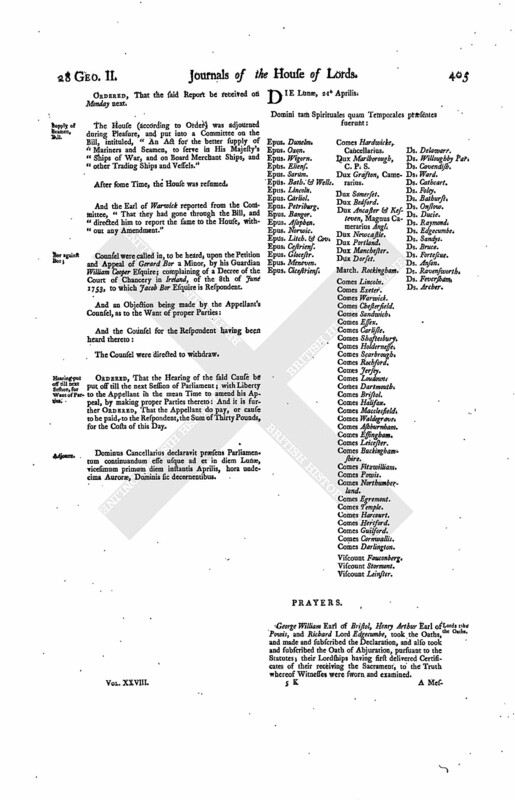 With a Bill, intituled, "An Act to enable the Churchwardens, Overseers, and Inhabitants, of the Parish of Saint Saviour, in the Borough of Southwark, in the County of Surry, to hold a Market within the said Parish, not interfering with the High Street in the said Borough;" to which they desire the Concurrence of this House. To return the Bill, intituled, "An Act for dissolving the Marriage of Richard Morgan Esquire with Anne Hall his now Wife; and to enable him to marry again; and for other Purposes therein mentioned;" and to acquaint this House, that they have agreed to the same, without any Amendment. To return the Bill, intituled, "An Act for vesting the Manor of North Weston, and several Lands and Hereditaments, in the County of Oxford, the Estate of Francis Clerke Esquire, in Trustees, in Trust to sell the same, to raise Money for Payment of Debts and Encumbrances affecting the same, and for other Purposes therein mentioned;" and to acquaint this House, that they have agreed to the same, without any Amendment. With a Bill, intituled, "An Act for granting to His Majesty the Sum of One Million, to be raised by a Lottery;" to which they desire the Concurrence of this House." With a Bill, intituled, "An Act for granting to His Majesty a certain Sum of Money, therein mentioned, out of the Sinking Fund; and applying certain Monies remaining in the Exchequer, for the Service of the Year One Thousand Seven Hundred and Fiftyfive; and for carrying the Surplus of certain Duties to the Sinking Fund; and for the further appropriating the Supplies granted in this Session of Parliament;" to which they desire the Concurrence of this House. Iedico Act, to continue, Bill. With a Bill, intituled, "An Act for continuing an Act, intituled, An Act for encouraging the making of Indico in the British Plantations in America;" to which they desire the Concurrence of this House. Acts to prevent Thefts, Robberies, &c. to make perpetual, &c. Bill. With a Bill, intituled, "An Act for making perpetual an Act passed in the Twenty-fifth Year of the Reign of His present Majesty, for the better preventing Thefts and Robberies, and for regulating Places of publick Entertainment, and punishing Persons keeping disorderly Houses; for the further punishing Persons selling Ale or other Liquors without License; for preventing the burning or destroying of Goss, Furze, or Fern, in Forests or Chaces; for giving further Time for the Payment of Duties omitted to be paid for the Indentures or Contracts of Clerks and Apprentices, and for the filing Affidavits of the Execution of Contracts of Clerks to Attornies and Solicitors;" to which they desire the Concurrence of this House. Horned Cattle, Laws to continue, Bill. With a Bill, intituled, "An Act to continue several Laws relating to the Distemper now raging among the Horned Cattle in this Kingdom;" to which they desire the Concurrence of this House. The Five last mentioned Bills were severally read the First Time. The Earl of Warwick reported from the Lords Committees to whom the Bill, intituled, "An Act for amending, widening, and keeping in Repair, the Roads from Epsom, through Ewell, to Tooting, and from Ewell to Kingston upon Thames and Thames Ditton, in the County of Surry," was committed: That they had considered the said Bill, and examined the Allegations thereof, which were found to be true; and that the Committee had gone through the Bill, and directed him to report the same to the House, without any Amendment." Hodie 3a vice lecta est Billa, intituled, "An Act for the better Supply of Mariners and Seamen, to serve in His Majesty's Ships of War, and on Board Merchant Ships, and other Trading Ships and Vessels." Importation of Tea and Spirituous Liquors in small Quantities, to prohibit, Bill. 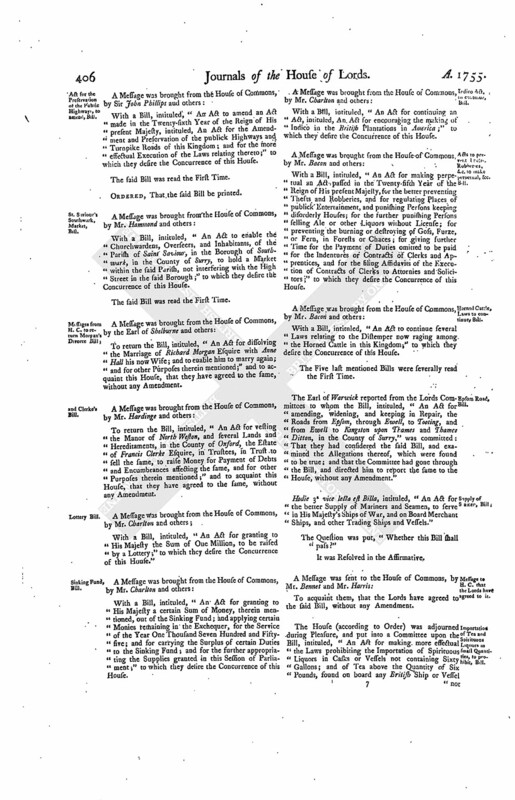 The House (according to Order) was adjourned during Pleasure, and put into a Committee upon the Bill, intituled, "An Act for making more effectual the Laws prohibiting the Importation of Spirituous Liquors in Casks or Vessels not containing Sixty Gallons; and of Tea above the Quantity of Six Pounds, found on board any British Ship or Vessel not belonging to, or employed, by The East India Company." And the Earl of Warwick reported from the Committee, "That they had gone through the Bill, and directed him to report the same to the House, without any Amendment." 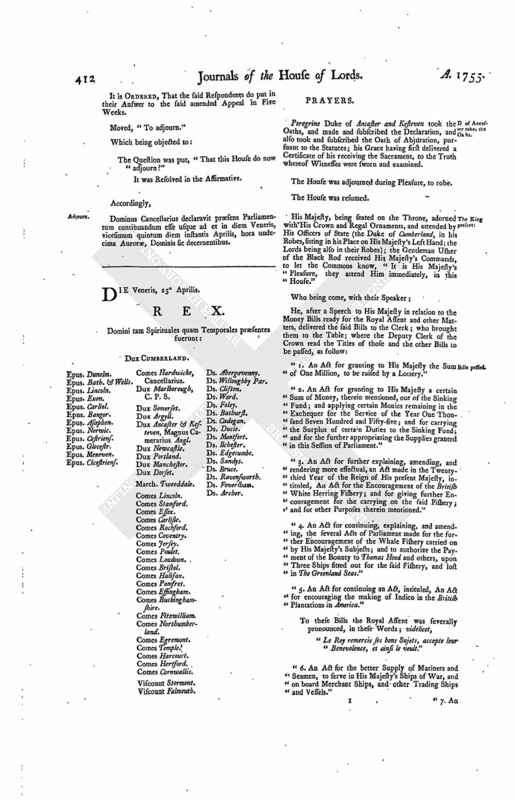 The House (according to Order) was adjourned during Pleasure, and put into a Committee upon the Bill, intituled, "An Act for continuing, explaining, and amending, the several Acts of Parliament made for the further Encouragement of the Whale Fishery carried on by His Majesty's Subjects; and to authorize the Payment of the Bounty to Thomas Hood and others, upon Three Ships fitted out for the said Fishery, and lost in The Greenland Seas." Grierson's Petition to receive Appeal, though out of Time, rejected. A Petition of James Grierson Merchant in Brechin, was presented, and read; setting forth, "That it became necessary for the Petitioner to bring an Appeal, from an Interlocutor of the Lords of Session in Scotland, of the 6th of March last; but, the Standing Order of this House, limiting a Time for presenting Appeals, being unknown to the Petitioner's Agent below, he did not employ an Agent in London, nor transmit the proper Instructions thither earlier than the 19th Instant;" and praying, "That their Lordships will be pleased to receive his said Appeal, notwithstanding the same hath not been presented within the Time limited by the said Standing Order." And thereupon the Petitioner's Agent was called in, and heard at the Bar. Persons who have omitted to qualify for Offices, Indemnity, Bill. 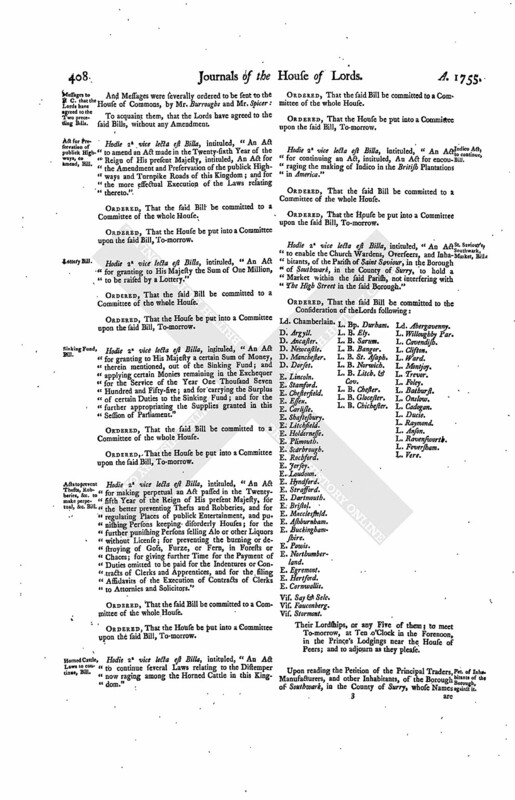 The Order of the Day being read, for receiving the Report of the Amendment made by the Committee of the whole House to the Bill, intituled, "An Act to indemnify Persons who have omitted to qualify themselves for Offices and Promotions within the Time limited by Law; and for allowing further Time for that Purpose:"
Hodie 3a vice lecta est Billa, intituled, "An Act for making more effectual the Laws prohibiting the Importation of Spirituous Liquors in Casks or Vessels not containing Sixty Gallons; and of Tea above the Quantity of Six Pounds, found on Board any British Ship or Vessel not belonging to, or employed by, The East India Company." Hodie 3a vice lecta est Billa, intituled, "An Act for amending, widening, and keeping in Repair, the Roads from Epsom, through Ewell, to Tooting, and from Ewell to Kingston upon Thames and Thames Ditton, in the County of Surry." Act for Preservation of publick Highways, to amend, Bill. Hodie 2a vice lecta est Billa, intituled, "An Act to amend an Act made in the Twenty-sixth Year of the Reign of His present Majesty, intituled, An Act for the Amendment and Preservation of the publick Highways and Turnpike Roads of this Kingdom; and for the more effectual Execution of the Laws relating thereto." Hodie 2a vice lecta est Billa, intituled, "An Act for granting to His Majesty the Sum of One Million, to be raised by a Lottery." Hodie 2a vice lecta est Billa, intituled, "An Act for granting to His Majesty a certain Sum of Money, therein mentioned, out of the Sinking Fund; and applying certain Monies remaining in the Exchequer for the Service of the Year One Thousand Seven Hundred and Fifty-five; and for carrying the Surplus of certain Duties to the Sinking Fund; and for the further appropriating the Supplies granted in this Session of Parliament." Hodie 2a vice lecta est Billa, intituled, "An Act for making perpetual an Act passed in the Twentyfifth Year of the Reign of His present Majesty, for the better preventing Thefts and Robberies, and for regulating Places of publick Entertainment, and punishing Persons keeping disorderly Houses; for the further punishing Persons selling Ale or other Liquors without License; for preventing the burning or destroying of Goss, Furze, or Fern, in Forests or Chaces; for giving further Time for the Payment of Duties omitted to be paid for the Indentures or Contracts of Clerks and Apprentices, and for the filing Affidavits of the Execution of Contracts of Clerks to Attornies and Solicitors." Hodie 2a vice lecta est Billa, intituled, "An Act to continue several Laws relating to the Distemper now raging among the Horned Cattle in this Kingdom." Indico Act, to continue, Bill. Hodie 2a vice lecta est Billa, intituled, "An Act for continuing an Act, intituled, An Act for encouraging the making of Indico in the British Plantations in America." St. Saviour's, Southwark, Market, Bill. Hodie 2a vice lecta est Billa, intituled, "An Act to enable the Church Wardens, Overseers, and Inhabitants, of the Parish of Saint Saviour, in the Borough of Southwark, in the County of Surry, to hold a Market within the said Parish, not interfering with The High Street in the said Borough." Vis. Stormont. L. Bp. Durham. L. B. Chichester. Ld. Abergavenny. Pet. of Inhabitants of the Borough, against it. It is Ordered, That the said Petition be referred to the Consideration of the Lords Committees to whom the said Bill stands committed; and that the Petitioners may be heard, by their Counsel, against the said Bill, before the said Committee; as may also Counsel be heard for the said Bill, at the same Time. Dominus Cancellarius declaravit præsens Parliamentum continuandum esse usque ad et in diem Mercurii, vicesimum tertium diem instantis Aprilis, hora undecima Auroræ, Dominis sic decernentibus. Persons who have omitted to quality for Offices, Indemnity, Bill. "Provided also, That this Act, or any Thing herein contained, shall not extend, or be contrued to extend, to any Person or Persons, who, having before the Twenty-seventh Year of the Reign of His present Majesty, incurred any Penalties, Incapacities, or Disabilities, by such Neglect or Omission as aforesaid, did neglect or omit to qualify themselves in such Manner, and within such Time, as is appointed by an Act of the Twenty-seventh Year of His present Majesty's Reign, intituled, An Act to indemnify Persons who have omitted to qualify themselves for Offices and Promotions within the Time limited by Law; and for allowing further Time for that Purpose." And the said Amendment, being read Twice by the Clerk, was disagreed to by the House. St. Saviour's, Southwark Market, Bill. The Lord Sandys reported from the Lords Committees to whom the Bill, intituled, "An Act to enable the Churchwardens, Overseers, and Inhabitants, of the Parish of Saint Saviour, in the Borough of Southwark, in the County of Surry, to hold a Market within the said Parish, not interfering with The High Street in the said Borough," was committed: "That they had considered the said Bill, and examined the Allegations thereof, which were found to be true; that no Counsel appeared at the Committee in Support of the Petition against the Bill; and that the Committee had gone through the Bill, and directed him to report the same to the House, without any Amendment." The House (according to Order) was adjourned during Pleasure, and put into a Committee upon the Bill, intituled, "An Act for granting to His Majesty the Sum of One Million, to be raised by a Lottery." 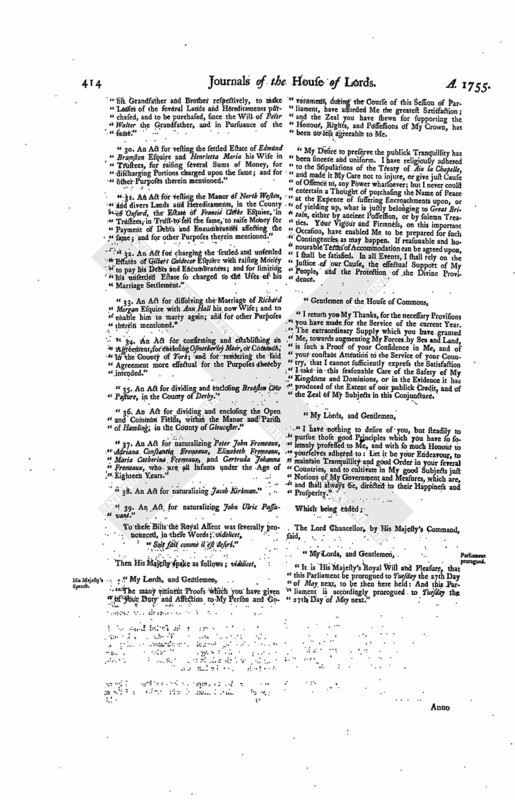 The House (according to Order) was adjourned during Pleasure, and put into a Committee on the Bill, intituled, "An Act for granting to His Majesty a certain Sum of Money, therein mentioned, out of the Sinking Fund; and applying certain Monies remaining in the Exchequer for the Service of the Year One Thousand Seven Hundred and Fifty-five; and for carrying the Surplus of certain Duties to the Sinking Fund; and for the further appropriating the Supplies granted in this Session of Parliament." The House (according to Order) was adjourned during Pleasure, and put into a Committee on the Bill, intituled, "An Act for continuing an Act, intituled, An Act for encouraging the making of Indico in the British Plantations in America." Act to prevent Thefts and Robberies, &c. to make perpetual, Bill. The House (according to Order) was adjourned during Pleasure, and put into a Committee upon the Bill, intituled, "An Act for making perpetual an Act passed in the Twenty-fifth Year of the Reign of His present Majesty, for the better preventing Thefts and Robberies, and for regulating Places of publick Entertainment, and punishing Persons keeping disorderly Houses; for the further punishing Persons selling Ale or other Liquors without License; for preventing the burning or destroying of Goss, Furze, or Fern, in Forests or Chaces; for giving further Time for the Payment of Duties omitted to be paid for the Indentures or Contracts of Clerks and Apprentices, and for the filing Affidavits of the Execution of Contracts of Clerks to Attornies and Solicitors." And the Earl of Warwick reported from the Committee, "That they had gone through the Bill; and directed him to report the same to the House, without any Amendment." The House (according to Order) was adjourned during Pleasure, and put into a Committee upon the Bill, intituled, "An Act to continue several Laws relating to the Distemper now raging among the Horned Cattle in this Kingdom." Act for Preservation of Public Highways, to amend, Bill. The House (according to Order) was adjourned during Pleasure, and put into a Committee on the Bill, intituled, "An Act to amend an Act made in the Twenty-sixth Year of the Reign of His present Majesty, intituled, An Act for the Amendment and Preservation of the publick Highways and Turnpike Roads of this Kingdom; and for the more effectual Execution of the Laws relating thereto." L. Ilchester takes the Oaths. Stephen Lord Ilchester took the Oaths, and made and subscribed the Declaration, and also took and subscribed the Oath of Abjuration, pursuant to the Statutes. Ordered, That this House will hear no more Causes during this Session. Clandestine Marriages in Scotland, to prevent, Bill. The Lord Bishop of Worcester presented a Bill, prepared by the Lords of Session in Scotland, pursuant to an Order of this House of the 17th of April 1753, intituled, "An Act for the better preventing of Clandestine Marriages in that Part of Great Britain called Scotland." Dominus Cancellarius declaravit præsens Parliamentum continuandum esse usque ad et in diem Jovis, vicesimum quartum diem instantis Aprilis, hora undecima Auroræ, Dominis sic decernentibus. Comes Marlborough, C. P. S.
Hodie 3a vice lecta est Billa, intituled, "An Act for granting to His Majesty the Sum of One Million, to be raised by a Lottery." Hodie 3a vice lecta est Billa, intituled, "An Act for granting to His Majesty a certain Sum of Money, therein mentioned, out of the Sinking Fund; and applying certain Monies remaining in the Exchequer for the Service of the Year One Thousand Seven Hundred and Fifty-five; and for carrying the Surplus of certain Duties to the Sinking Fund; and for the further appropriating the Supplies granted in this Session of Parliament." Hodie 3a vice lecta est Billa, intituled, "An Act to amend an Act made in the Twenty-sixth Year of the Reign of His present Majesty, intituled, An Act for the Amendment and Preservation of the publick Highways and Turnpike Roads of this Kingdom; and for the more effectual Execution of the Laws relating thereto." Hodie 3a vice lecta est Billa, intituled "An Act for continuing an Act, intituled, An Act for encouraging the making of Indico in the British Plantations in America." Hodie 3a vice lecta est Billa, intituled, "An Act to continue several Laws relating to the Distemper now raging among the Horned Cattle in this Kingdom." Hodie 3a vice lecta est Billa, intituled, "An Act to indemnify Persons who have omitted to qualify themselves for Offices and Promotions within the Time limited by Law; and for allowing further Time for that Purpose." Hodie 3a vice lecta est Billa, intituled, "An Act for continuing, explaining, and amending, the several Acts of Parliament made for the further Encouragement of the Whale Fishery carried on by His Majesty's Subjects; and to authorize the Payment of the Bounty to Thomas Hood and others, upon Three Ships fitted out for the said Fishery, and lost in The Greenland Seas." Hodie 3a vice lecta est Billa, intituled, "An Act to enable the Churchwardens, Overseers, and Inhabitants, of the Parish of Saint Saviour, in the Borough of Southwark, in the County of Surry, to hold a Market within the said Parish, not interfering with The High Street in the said Borough." Hodie 3a vice lecta est Billa, intituled, "An Act for making perpetual an Act passed in the Twentyfifth Year of the Reign of His present Majesty, for the better preventing Thefts and Robberies, and for regulating Places of publick Entertainment, and punishing Persons keeping disorderly Houses; for the further punishing Persons selling Ale or other Liquors without License; for preventing the burning or destroying of Goss, Furze, or Fern, in Forests or Chaces; for giving further Time for the Payment of Duties omitted to be paid for the Indentures or Contracts of Clerks and Apprentices, and for the filing Affidavits of the Execution of Contracts of Clerks to Attornies and Solicitors." Bor against Bor, new Respondents to answer. Upon reading the Petition of Gerard Bor, a Minor, by William Cooper Esquire his Guardian, Appellant in a Cause depending in this House, wherein Jacob Bor Esquire is Respondent; setting forth, "That, by their Lordships Order of the 18th Instant, the Hearing of the said Cause was put off till the next Session, with Liberty for the Petitioner, in the mean Time, to amend his Appeal, by making proper Parties Respondents thereto; and that the Petitioner hath amended the same accordingly;" and praying, "That the new-made Parties may be ordered to answer in the usual Time:"
It is Ordered, That the said Respondents do put in their Answer to the said amended Appeal in Five Weeks. The Question was put, "That this House do now adjourn?" Dominus Cancellarius declaravit præsens Parliamentum continuandum esse usque ad et in diem Veneris, vicesimum quintum diem instantis Aprilis, hora undecima Auroræ, Dominis sic decernentibus. D of Ancaster takes the Oaths. Peregrine Duke of Ancaster and Kesteven took the Oaths, and made and subscribed the Declaration, and also took and subscribed the Oath of Abjuration, pursuant to the Statutes; his Grace having first delivered a Certificate of his receiving the Sacrament, to the Truth whereof Witnesses were sworn and examined. His Majesty, being seated on the Throne, adorned with His Crown and Regal Ornaments, and attended by His Officers of State (the Duke of Cumberland, in his Robes, sitting in his Place on His Majesty's Left Hand; the Lords being also in their Robes); the Gentleman Usher of the Black Rod received His Majesty's Commands, to let the Commons know, "It is His Majesty's Pleasure, they attend Him immediately, in this House." "1. An Act for granting to His Majesty the Sum of One Million, to be raised by a Lottery." "2. An Act for granting to His Majesty a certain Sum of Money, therein mentioned, out of the Sinking Fund; and applying certain Monies remaining in the Exchequer for the Service of the Year One Thousand Seven Hundred and Fifty-five; and for carrying the Surplus of certain Duties to the Sinking Fund; and for the further appropriating the Supplies granted in this Session of Parliament." "3. An Act for further explaining, amending, and rendering more effectual, an Act made in the Twentythird Year of the Reign of His present Majesty, intituled, An Act for the Encouragement of the British White Herring Fishery; and for giving further Encouragement for the carrying on the said Fishery; and for other Purposes therein mentioned." "4. An Act for continuing, explaining, and amending, the several Acts of Parliament made for the further Encouragement of the Whale Fishery carried on by His Majesty's Subjects; and to authorize the Payment of the Bounty to Thomas Hood and others, upon Three Ships sitted out for the said Fishery, and lost in The Greenland Seas." "5. An Act for continuing an Act, intituled, An Act for encouraging the making of Indico in the British Plantations in America." "6. An Act for the better Supply of Mariners and Seamen, to serve in His Majesty's Ships of War, and on board Merchant Ships, and other Trading Ships and Vessels." "7. 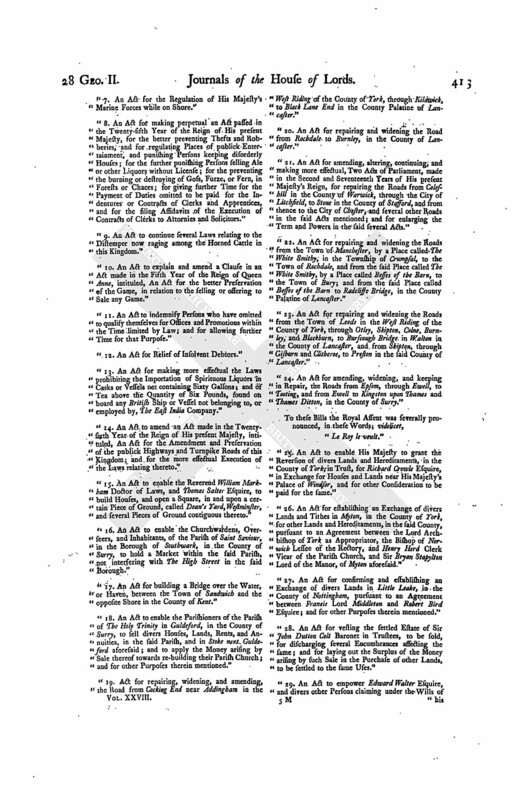 An Act for the Regulation of His Majesty's Marine Forces while on Shore." "8. An Act for making perpetual an Act passed in the Twenty-sifth Year of the Reign of His present Majesty, for the better preventing Thefts and Robberies, and for regulating Places of publick Entertainment, and punishing Persons keeping disorderly Houses; for the further punishing Persons selling Ale or other Liquors without License; for the preventing the burning or destroying of Goss, Furze, or Fern, in Forests or Chaces; for giving further Time for the Payment of Duties omitted to be paid for the Indentures or Contracts of Clerks and Apprentices, and for the filing Affidavits of the Execution of Contracts of Clerks to Attornies and Solicitors." "9. An Act to continue several Laws relating to the Distemper now raging among the Horned Cattle in this Kingdom." "10. An Act to explain and amend a Clause in an Act made in the Fifth Year of the Reign of Queen Anne, intituled, An Act for the better Preservation of the Game, in relation to the selling or offering to Sale any Game." "11. An Act to indemnify Persons who have omitted to qualify themselves for Offices and Promotions within the Time limited by Law; and for allowing further Time for that Purpose." "12. An Act for Relief of Insolvent Debtors." "13. An Act for making more effectual the Laws prohibiting the Importation of Spirituous Liquors in Casks or Vessels not containing Sixty Gallons; and of Tea above the Quantity of Six Pounds, found on board any British Ship or Vessel not belonging to, or employed by, The East India Company." "14. An Act to amend an Act made in the Twentysixth Year of the Reign of His present Majesty, intituled, An Act for the Amendment and Preservation of the publick Highways and Turnpike Roads of this Kingdom; and for the more effectual Execution of the Laws relating thereto." "15. An Act to enable the Reverend William Markham Doctor of Laws, and Thomas Salter Esquire, to build Houses, and open a Square, in and upon a certain Piece of Ground, called Dean's Yard, Westminster, and several Pieces of Ground contiguous thereto." "16. An Act to enable the Churchwardens, Overseers, and Inhabitants, of the Parish of Saint Saviour, in the Borough of Southwark, in the County of Surry, to hold a Market within the said Parish, not interfering with The High Street in the said Borough." "17. An Act for building a Bridge over the Water, or Haven, between the Town of Sandwich and the opposite Shore in the County of Kent." "18. 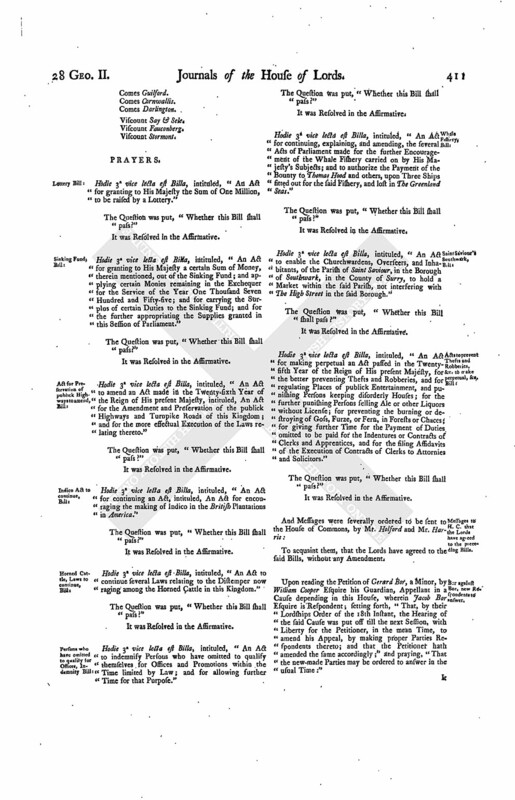 An Act to enable the Parishioners of the Parish of The Holy Trinity in Guldeford, in the County of Surry, to sell divers Houses, Lands, Rents, and Annuities, in the said Parish, and in Stoke next Guldeford aforesaid; and to apply the Money arising by Sale thereof towards re-building their Parish Church; and for other Purposes therein mentioned." "19. Act for repairing, widening, and amending, the Road from Cocking End near Addingham in the West Riding of the County of York, through Kildwick, to Black Lane End in the County Palatine of Lancaster." "20. An Act for repairing and widening the Road from Rochdale to Burnley, in the County of Lancaster." "21. 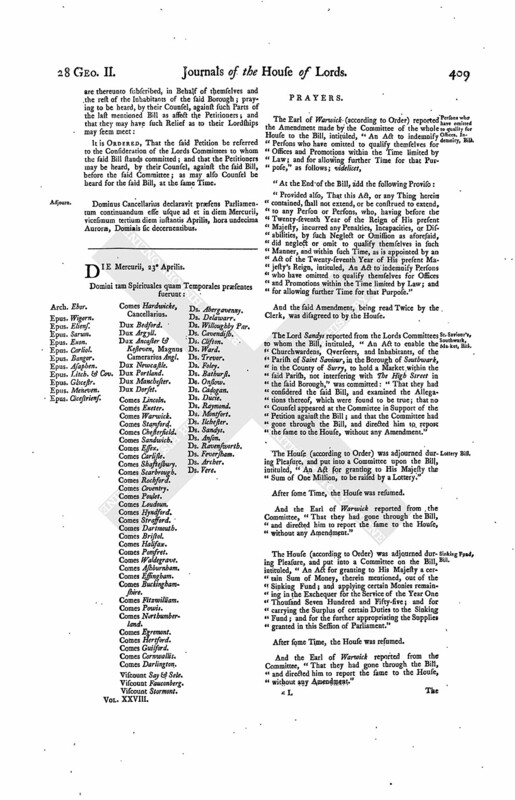 An Act for amending, altering, continuing, and making more effectual, Two Acts of Parliament, made in the Second and Seventeenth Years of His present Majesty's Reign, for repairing the Roads from Colesbill in the County of Warwick, through the City of Litchfield, to Stone in the County of Stafford, and from thence to the City of Chester, and several other Roads in the said Acts mentioned; and for enlarging the Terms and Powers in the said several Acts." "22. An Act for repairing and widening the Roads from the Town of Manchester, by a Place called The White Smithy, in the Township of Crumpsal, to the Town of Rochdale, and from the said Place called The White Smithy, by a Place called Besses of the Barn, to the Town of Bury; and from the said Place called Besses of the Barn to Radcliffe Bridge, in the County Palatine of Lancaster." "23. 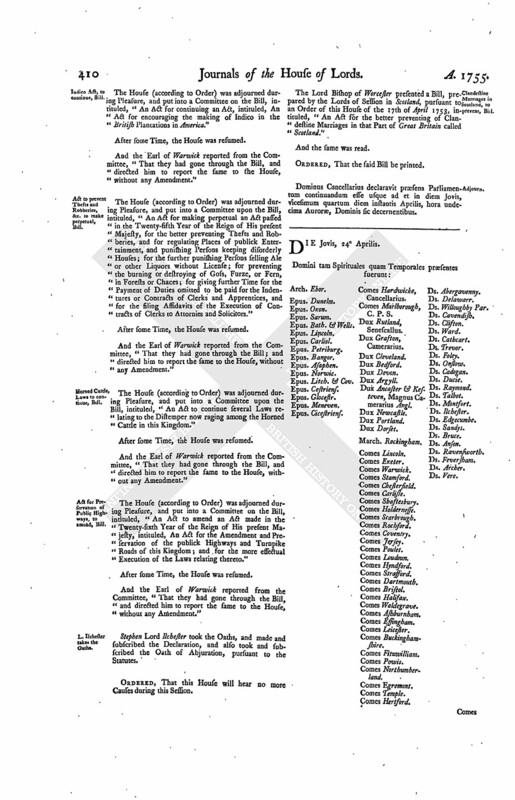 An Act for repairing and widening the Roads from the Town of Leeds in the West Riding of the County of York, through Otley, Skipton, Colne, Burnley, and Blackburn, to Burscough Bridge in Walton in the County of Lancaster, and from Skipton, through Gisburn and Clitheroe, to Preston in the said County of Lancaster." "24. An Act for amending, widening, and keeping in Repair, the Roads from Epsom, through Ewell, to Tooting, and from Ewell to Kingston upon Thames and Thames Ditton, in the County of Surry." "25. An Act to enable His Majesty to grant the Reversion of divers Lands and Hereditaments, in the County of York, in Trust, for Richard Crowle Esquire, in Exchange for Houses and Lands near His Majesty's Palace of Windsor, and for other Consideration to be paid for the same." "26. 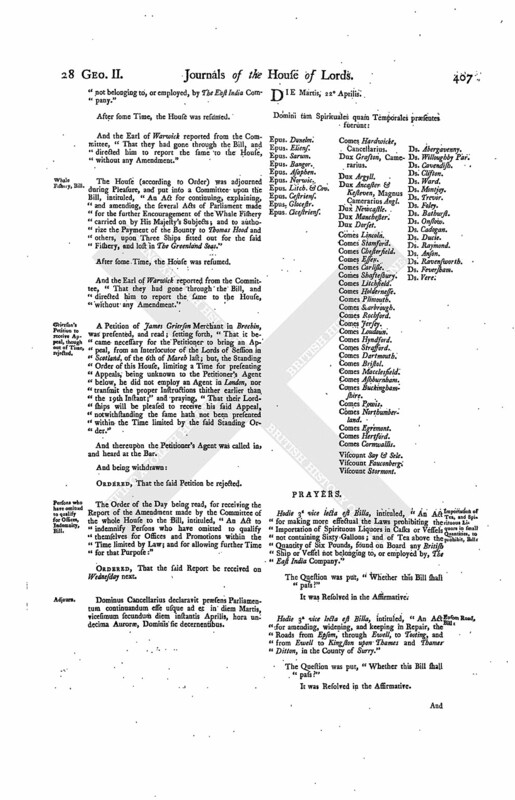 An Act for establishing an Exchange of divers Lands and Tithes in Myton, in the County of York, for other Lands and Hereditaments, in the said County, pursuant to an Agreement between the Lord Archbishop of York as Appropriator, the Bishop of Norwich Lessee of the Rectory, and Henry Herd Clerk Vicar of the Parish Church, and Sir Bryan Stapylton Lord of the Manor, of Myton aforesaid." "27. An Act for confirming and establishing an Exchange of divers Lands in Little Leake, in the County of Nottingham, pursuant to an Agreement between Francis Lord Middleton and Robert Bird Esquire; and for other Purposes therein mentioned." "28. An Act for vesting the settled Estate of Sir John Dutton Colt Baronet in Trustees, to be sold, for discharging several Encumbrances affecting the same; and for laying out the Surplus of the Money arising by such Sale in the Purchase of other Lands, to be settled to the same Uses." "29. An Act to empower Edward Walter Esquire, and divers other Persons claiming under the Wills of his Grandfather and Brother respectively, to make Leases of the several Lands and Hereditaments purchased, and to be purchased, since the Will of Peter Walter the Grandfather, and in Pursuance of the same." "30. An Act for vesting the settled Estate of Edmund Bramston Esquire and Henrietta Maria his Wife in Trustees, for raising several Sums of Money, for discharging Portions charged upon the same; and for other Purposes therein mentioned." "31. An Act for vesting the Manor of North Weston, and divers Lands and Hereditaments, in the County of Oxford, the Estate of Francis Clerke Esquire, in Trustees, in Trust to sell the same, to raise Money for Payment of Debts and Encumbrances affecting the same; and for other Purposes therein mentioned." "32. An Act for charging the settled and unsettled Estates of Gilbert Caldecor Esquire with raising Money to pay his Debts and Encumbrances; and for limiting his unsettled Estate so charged to the Uses of his Marriage Settlement." "33. An Act for dissolving the Marriage of Richard Morgan Esquire with Ann Hall his now Wife; and to enable him to marry again; and for other Purposes therein mentioned." "34. An Act for confirming and establishing an Agreement, for enclosing Osmotherley Moor, or Common, in the County of York; and for rendering the said Agreement more effectual for the Purposes thereby intended." "35. An Act for dividing and enclosing Breaston Cow Pasture, in the County of Derby." "36. An Act for dividing and enclosing the Open and Common Fields, within the Manor and Parish of Hawling, in the County of Gloucester." "37. An Act for naturalizing Peter John Fremeaux, Adriana Constantia Fremeaux, Elizabeth Fremeaux, Maria Catherina Fremeaux, and Gertruda Johanna Fremeaux, who are all Infants under the Age of Eighteen Years." "38. An Act for naturalizing Jacob Kirkman." "39. An Act for naturalizing John Ulric Passavant." "Soit fait comme il est desire." "The many eminent Proofs which you have given of your Duty and Affection to My Person and Government, during the Course of this Session of Parliament, have afforded Me the greatest Satisfaction; and the Zeal you have shewn for supporting the Honour, Rights, and Possessions of My Crown, has been no less agreeable to Me. "My Desire to preserve the publick Tranquillity has been sincere and uniform. I have religiously adhered to the Stipulations of the Treaty of Aix la Chapelle, and made it My Care not to injure, or give just Cause of Offence to, any Power whatsoever; but I never could entertain a Thought of purchasing the Name of Peace at the Expence of suffering Encroachments upon, or of yielding up, what is justly belonging to Great Britain, either by ancient Possession, or by solemn Treaties. Your Vigour and Firmness, on this important Occasion, have enabled Me to be prepared for such Contingencies as may happen. If reasonable and honourable Terms of Accommodation can be agreed upon, I shall be satisfied. In all Events, I shall rely on the Justice of our Cause, the effectual Support of My People, and the Protection of the Divine Providence. "I return you My Thanks, for the necessary Provisions you have made for the Service of the current Year. The extraordinary Supply which you have granted Me, towards augmenting My Forces by Sea and Land, is such a Proof of your Confidence in Me, and of your constant Attention to the Service of your Country, that I cannot sufficiently express the Satisfaction I take in this seasonable Care of the Safety of My Kingdoms and Dominions, or in the Evidence it has produced of the Extent of our publick Credit, and of the Zeal of My Subjects in this Conjuncture. "I have nothing to desire of you, but steadily to pursue those good Principles which you have so solemnly professed to Me, and with so much Honour to yourselves adhered to: Let it be your Endeavour, to maintain Tranquillity and good Order in your several Countries, and to cultivate in My good Subjects just Notions of My Government and Measures, which are, and shall always be, directed to their Happiness and Prosperity." "It is His Majesty's Royal Will and Pleasure, that this Parliament be prorogued to Tuesday the 27th Day of May next, to be then here held: And this Parliament is accordingly prorogued to Tuesday the 27th Day of May next."